14th March of vivo ipl 2018 will be played between MI and RCB in Wankhede stadium Mumbai at 8:00pm. Both teams have played 3 matches each in which RCB have won 1match but MI lost all 3 matches. So RCB is in little better position as compared to MI . This match will be do or die match for MI. 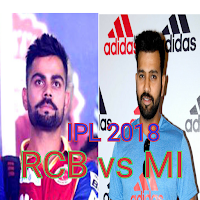 Main fact is that Virat Kohli the captain of RCB came back in form in previous match in which he scored over half century but Rohit Sharma captain of MI is not in form. He didn't play long inning in any match out of all three matches. My prediction for chance to win MI vs RCB is 55/45.